You can watch the full interview as aired in the two videos embedded at the bottom of this post. 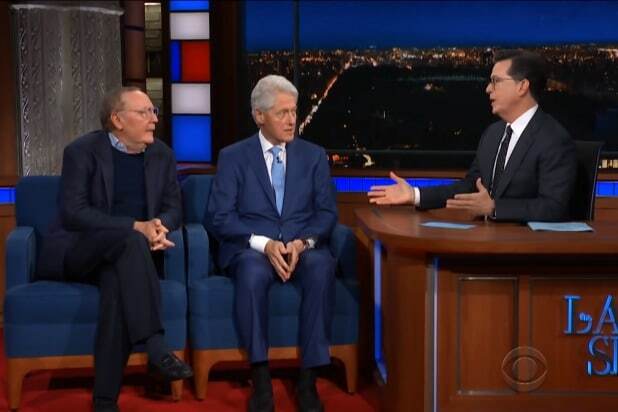 The big moment in the interview came at the beginning when Colbert confronted Clinton over comments he made on Monday on “The Today Show” about the #MeToo movement that had been widely derided as “tone-deaf.” Clinton did not try to defend himself, instead, admitting his mistake, saying “I was mad at me” when he watched the interview later. “I still believe this ‘Me Too’ movement is long overdue, necessary and should be supported,” Clinton said, apologetically. The comments in question came during a contentious interview with Craig Melvin in which they discussed the Monica Lewinsky scandal that took place during Clinton’s presidency. Aside from apologizing for those comments, Clinton also discussed the current political situation in the U.S., reminding viewers that it’s just as important to vote in midterm elections as it is to vote during presidential elections. Tuesday saw eight states hold primary midterm elections, including California, New Jersey and Alabama. Clinton also touched on Donald Trump’s roller coaster attempts to broker some kind of nuclear deal with North Korea, expressing his hope that Trump will be able to pull it off — a relatable sentiment since the majority of the world is opposed to nuclear war. As mentioned previously, you can check out the full interview in the pair of videos below.